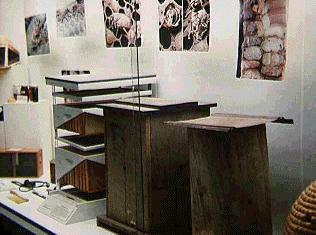 The Insect Museum at the Cincinnati Zoo demonstrates the way bees have been kept through the years. We have a page dedicated to the many historical and hysterical gadflies who have had a thing or two to do with bees through the centuries. Check out our famous people page, with brief bios about some beekeepers who have contributed so much to the art and craft of beekeeping. Bees parked in the middle of a half section (320 acres) of buckwheat, in western Pennsylvania. In favourable seasons, bees on buckwheat may make fifty pounds or so of the black, strong flavoured honey. Buckwheat typically blooms during the first couple of weeks of August in the north country. It takes strong bees to make lots of honey. This prairie bee yard in southern Saskatchewan allowed three rounds of filled supers to be removed - about 300 pounds of white alfalfa and yellow sweet clover per hive.